O'Reilly Media's Maker Media unit publishes Make Magazine and operates Maker Faire, the world's largest gathering of DIY hardware enthusiasts and entrepreneurs. home could have a presence at Maker Faire, soliciting digital models for visual effects while building an open-source online 3D printing library applicable to real-world Mars use - inspired by home, even mentioned and used in episodes. "Thingiverse is a place to share digital designs with the world. We believe that just as computing shifted away from the mainframe into the personal computer that you use today, digital fabrication will share the same path. In fact, it is already happening: laser cutters, cnc machines, 3D printers, and even automated paper cutters are all getting cheaper by the day. These machines are useful for a huge variety of things, but you need to supply them with a digital design in order to get anything useful out of them. We're hoping that together we can create a community of people who create and share designs freely, so that all can benefit from them." The MakerBot Replicator™ is the tool from tomorrow, today. MakerBot Industries demonstrates its dedication to putting the tools of creativity into the hands of the those brilliant and bold enough to bring their imagination into the physical world. The MakerBot Replicator™ is an affordable, open source 3D printer that is compact enough to sit on your desktop. 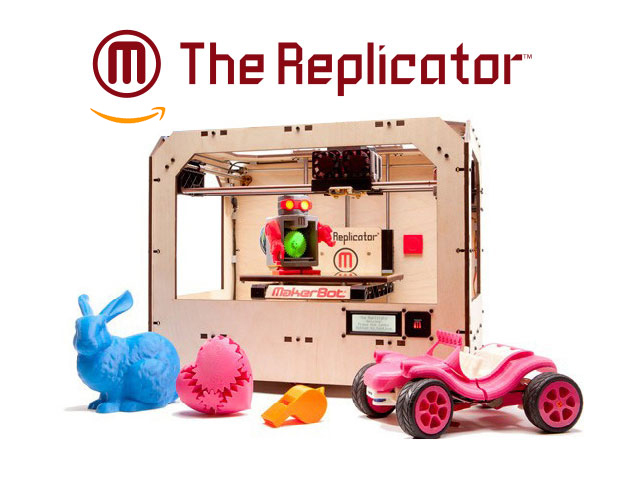 It is also an essential tool for children and students; parents and educators with a MakerBot Replicator™ offer the next generation an opportunity to learn the digital designing skills required to solve the problems of the future.